How many of us are afraid to say who we are and what we want? Afraid of disappointing our parents, our friends, lovers, colleagues? We’re afraid we don’t deserve to wear the badge. It’s pompous, show-offy, pretentious. We think it takes someone else to anoint us as an artist before we can own it. acknowledging this compulsion to make meaningful work, this is a jump that you make alone. Until you’re willing to stop waiting for someone else to tell you who you are, you’ll always be sitting on the sidelines of your own life, waiting to be invited to play. But maybe you’re one of the lucky ones? Maybe you’ve embraced your identity and accepted your path? Maybe you’ve learned to embrace the term ‘artist’ and you wear the badge proudly? It boggles the mind that there’s so much shame attached to this one word, this one label. Artist. But shame and creativity make a lethal cocktail. As an artist, you literally cannot afford to feel shame. Shame is toxic and it will shut your creativity right down. When someone challenges your right to the term ‘artist,’ they’re acting from their own shame, their own issues. Maybe they’re threatened by the specter of someone engaging with the invisible and bringing it to life? By making. By having fun. By revealing. By feeling alive and connected. It doesn’t matter if you’re not there yet. It doesn’t matter if you’re still trying to figure out whether you are or you aren’t. It doesn’t matter because this is a conversation that artists never stop having with themselves. Your questions, challenges, your moments of profound connection and bliss; they will constantly accompany you on this journey. By paying attention, by honoring them, your work and your life will begin to come together in more meaningful ways. There may have been a beginning to your artistic journey, but there is no end. Once you’ve heard the whisper of The Muse, you are forever changed. You will always see life differently. Remember, being an artist is who you are. That doesn’t wash off. But it may need to be polished so that your light can shine more brightly. It doesn’t take a vow of poverty to be artist. It doesn’t mean you’ve got to leave your family or quit your day job. It’s about bringing more of yourself into your life and allowing that energy to radiate into all you do. It’s about understanding the ebb and flow of creativity and dancing with it. Because you are an artist. 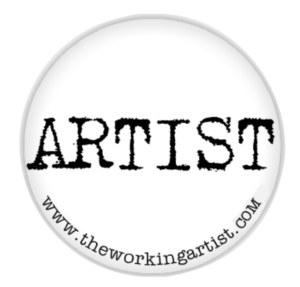 If you want to learn more about working and living as an artist, join my mailing list now. No spam. Lots of wonderful surprises. Get it now.